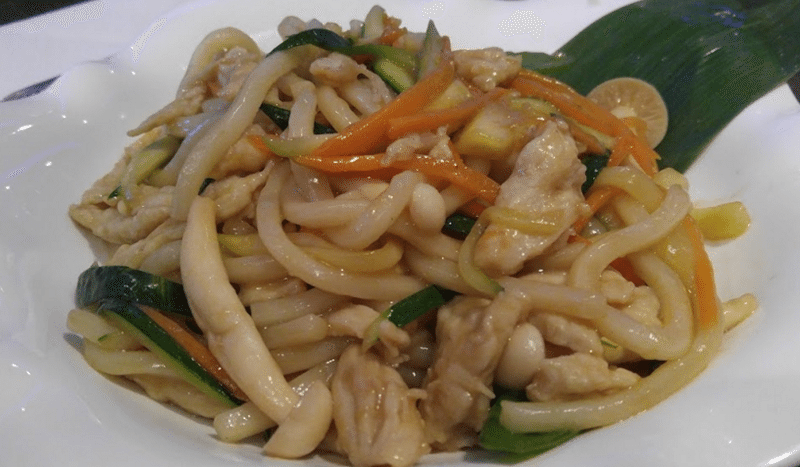 Yaki Udon (stir fried noodles) with organic chicken and vegetables is recommended for the less adventurous diner who wants something filling. A year ago, an accomplished sushi chef named Max drove by a for rent sign in the window of Sake 68, a short-lived Japanese restaurant at 68 Middle Neck Rd. The chef, looking to create a modern Japanese dining experience, painstakingly designed a vibrant dining room and crafted a menu that combined both traditional and contemporary cooking methods. About a month later, Max and his wife, Michelle, opened Mizu to the public. Mizu is an Asian-fusion restaurant that specializes mainly in Japanese cooking but also offers Chinese, Thai and Korean options. 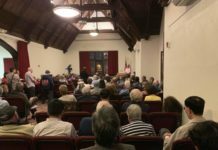 The couple decided to open Mizu in Great Neck because, like their menu, Great Neck houses a diverse population from various backgrounds. The restaurant’s decor is modern and bright. The entrance features a blue waterfall display, leather chairs accompany its approximately 15 tables, colorful neon lights line the walls and highlight the sushi counter, and a traditional Japanese curtain hangs by the entrance to the kitchen. 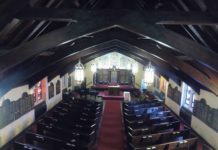 The ambiance is suitable for all types of events, whether a romantic date, dinner with friends, family gathering or small party. As customers walk into the restaurant, the staff attentively seats them and alerts them to fresh specials. Mizu offers a variety of Japanese fare throughout both lunch and dinner. For cold appetizers, Mizu developed a few unique options based on more traditional Japanese recipes, such as Angus beef tenderloin in Cajun seasoning. Warm appetizers consist of classics like gyoza (Japanese dumplings) and, for more adventurous diners, Ika Maru (Japanese squid in garlic sauce), as well as Asian-fusion options, such as Miyazaki short ribs prepared in a Korean-style sauce and Peking crispy duck. The sushi menu features a wide array of fresh fish that comes into the restaurant daily. Mizu offers more than 30 varieties of fish including sea urchin and more than 60 types of special rolls. Dinner entrées consist of both standard Japanese-American fare, such as hibachi organic chicken or seafood tempura, and more modern dishes, such as basil filet mignon or surf and turf. Plus, the highly recommended small Asian-fusion menu offers Thai, Korean and Chinese options. Most appetizers range from $5 to $13, many of the specialty rolls are $5 to $15 and most of the entrées cost $13 to $25. The Eggplant Sandwich consists of deep fried eggplant surrounded by lobster salad, spicy tuna and salmon in a sweet brown sauce. On a recent visit, my table tried the eggplant sandwich ($12), a sushi-like deep-fried eggplant surrounded by lobster salad, spicy tuna and salmon in a sweet brown sauce. The contrast of the bitter eggplant, the sweet lobster salad and the spicy tuna worked really well, creating an extraordinary balance of flavors. The softness of the seafood juxtaposed with the crunch from the eggplant breading added a nice textural disparity. Mizu’s Bibimbap, a Korean-style rice bowl with fresh vegetables and ground beef, adds variety to the primarily Japanese menu. 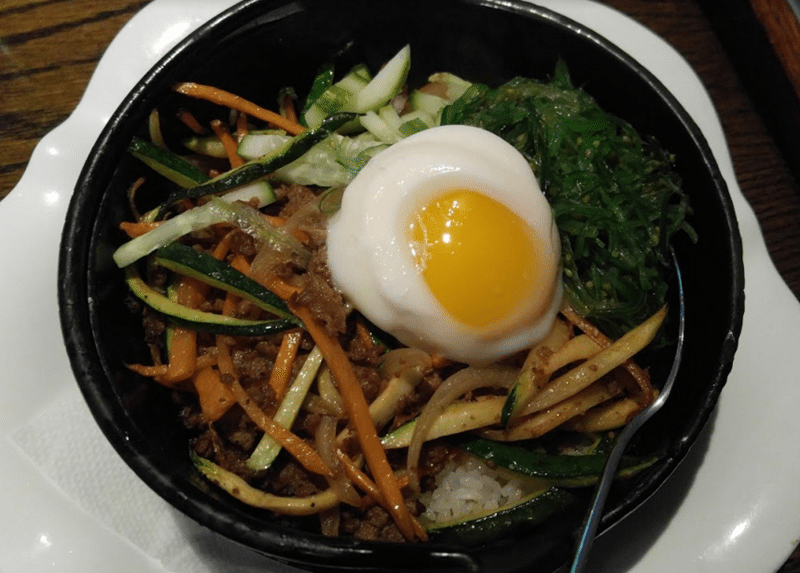 I tried their Bibimbap ($13), a Korean-style rice bowl with fresh vegetables and ground beef or chicken prepared in a hot stone bowl. The combination of the beef with thin seaweed salad, carrots, mushroom and cucumber worked well, but the addition of the spicy red sauce (Gochujang) tied the dish together. The rice on the bottom of the stone pot was crispy, the sign of a perfect Bibimbap. 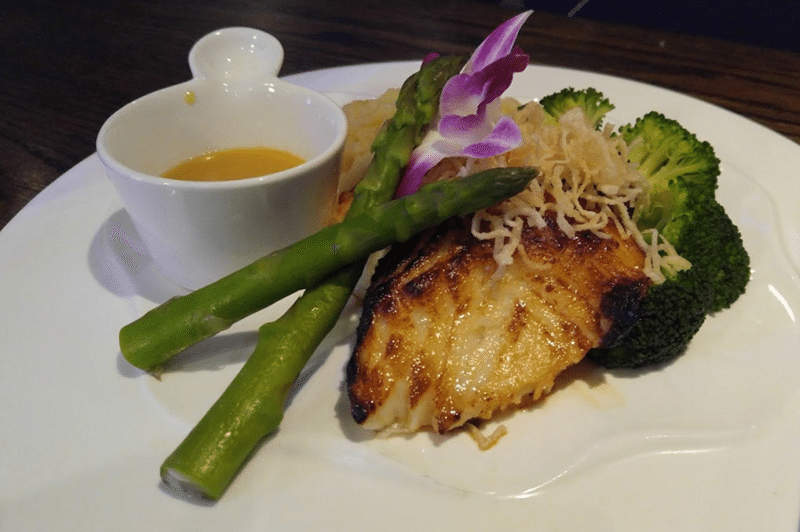 Mizu’s Chilean sea bass, prepared with a citrus miso glaze, has such a superb, flaky texture which nicely contrasts the asparagus and broccoli. The standout dish was definitely the Chilean sea bass ($23), cooked perfectly in an Asian citrus miso glaze and served with fresh vegetables. Although prepared in a sweet miso sauce, the delicate fish had such a succulent mild taste. The asparagus and broccoli added color to the dish. While a slight language barrier may exist between the staff and clientele, the employees’ attentiveness and attention to detail helps create a positive dining experience. The combination of an accommodating atmosphere, modern decor and a mixture of traditional cooking from the owners’ roots along with more contemporary fare makes Mizu much more than a place where one simply eats, pays and leaves. Mizu embraces the exploration of various cultures in a relaxed, inclusive setting.